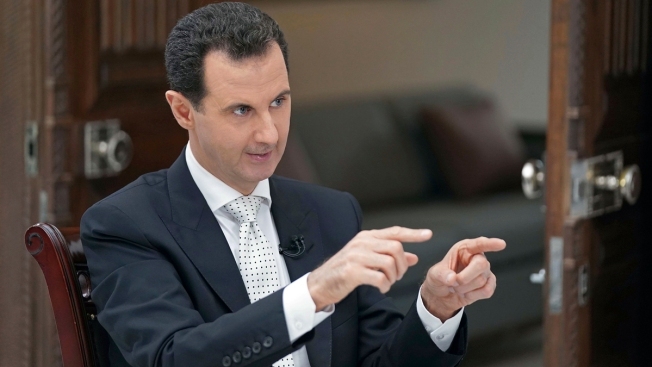 In this Thursday, May 10, 2018, file photo released by the Syrian official news agency SANA, Syrian President Bashar Assad speaks during an interview with the Greek Kathimerini newspaper, in Damascus, Syria. The head of the world’s chemical weapon watchdog is questioning whether Syrian President Bashar al-Assad has declared his entire chemical arsenal, NBC News reported. Ahmet Uzumcu, the director general of the Organization for the Prohibition of Chemical Weapons (OPCW) pointed out that attacks involving chlorine barrel bombs and the nerve agent sarin have continued despite a landmark agreement that won the group a Nobel Peace Prize in 2013. The use of sarin in February 2017 raised concerns that Syria may have kept certain banned substances despite the government saying it surrendered its stockpile of chemical agents in 2013, Uzumcu said. Syrian "authorities have to explain in a plausible, technically plausible manner why the samples collected by our experts did prove the existence of certain chemicals which were never declared," Uzumcu said in an interview with NBC News. "So they should explain why those chemicals were present in such places."